This is a press statement from the Presidency through the Special Adviser to the President (Media& Publicity) Femi Adesina. 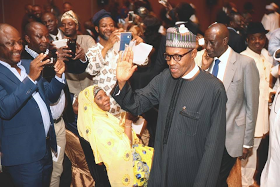 President Muhammadu Buhari on Sunday in Doha charged Nigerians to rekindle the spirit of patriotism and selfless service to encourage more foreign investment in the country.Speaking at a town hall meeting with members of the Nigerian community in Doha, the President assured them that the Federal Government would continue to create the enabling environment for investments in the country, anchored on peace and security. ``We have abundant natural and human resources in the country, including huge oil and gas deposit. ``But the challenge is securing those installations and to persuade some of our countrymen to be more patriotic and stop sabotaging the installations. ``When people are being abducted and some are being murdered, when installations are being blown up now and then, the incentive for people to invest in our infrastructure is quite slim’’. President Buhari also promised to look into the complaints of alleged blanket denial of visas to families and relatives of Nigerians intending to visit the State of Qatar. ``Like I tell other Nigerians living in other countries, you must be good ambassadors of the country because globally things are quite difficult in terms of security and the economy. ``If you have something doing, please hold it tight to your heart and try to improve on it because things are quite difficult all over. ``For us in Nigeria, we are trying to do our best to reduce unemployment and we realised this quite early enough, that was why we campaigned on the diversification of the economy. ``We have to go back to agriculture, like in the good old days of cocoa, palm oil, palm kernel, cotton, groundnuts, hides and skins’’. On the fight against terrorism, the President told Nigerians living in Qatar that the military have made remarkable progress in dislodging Boko Haram terrorists from their previous strongholds in the North eastern part of the country. ``When we came in May 2015, the Boko Haram were effectively holding 14 local governments out of 774 local governments in Nigeria but today they are not holding a single local government,’’ he said. He said the military and law enforcement agencies were working very hard to prevent and counter Boko Haram attacks on soft targets in the country.